Recognize and address any stressors that might contribute to your pet's anxiety, such as slippery floors and tables. Going to the vet is undeniably stressful for many pets and their owners. And when you look at these necessary veterinary visits from your pet’s perspective, it’s easy to see why. Clinics are full of strange sights, sounds, and smells, not to mention other animals! The exam itself ofteninvolves some fairly thorough handling by a stranger. And, cat owners, did we mention the dreaded car ride? It’s often enough to make the most timid pet attempt a perilous escape. The good news: There’s a movement in veterinary practice to promote fear-free visits. Some clinics intentionally provide a low-stress practice environment and handling protocols that help safeguard against emotional distress. Even if your clinic has implemented some of these pet-friendly strategies, it’s a good idea to learn and embrace some basic socialization and training techniques that will make it a little less overwhelming for your furry friends to receive the essential care that can lead to a longer and healthier life. Socialization is important early on and throughout a pet’s lifetime. Dogs trained with aversive methods (including aggressive use of prong or choke chains, yelling, electric or spray collars, electronic fences, or physical punishment) are two times more likely to act aggressively towardpeople outside the home, according to a University of Bristol study. Reward-based training, on the other hand, decreases the chances of aggression and makes for a more confident, calm dogwho has a more positive association with people. Find a trainer in the area who uses positive, non-force-based training. Kitten socialization classes are also gaining popularity across the country. Some groups may even offer special training to help prepare dogs and cats for the experiences they’ll encounter during a routine veterinary visit, like training dogs to present a paw for examination. In addition to classes, consider inviting visitors over to your home or going on outings that will expose your pet to new people, places, and animals — but make sure you’re working within yourpet’s relative comfort level so she stays relaxed. Talk to your veterinarian about how to safely provide the additional socialization your animal needs while still safeguarding her physical health. Doing so will help build your pet’s confidence and comfort in unfamiliar situations. Cats in particular can become anxious even before you leave the house. Pulling out the pet carrier and placing the pet in the car, for example, often means that something negative and unpredictable is likely to happen. So by the time your pet gets to the vet, he’s already in a panic. You can stem some of the anxiety by providing ongoing positive experiences outside the home. Make car rides a regular part of your routine, so your pet learns that these outings don’t automatically spell trouble. 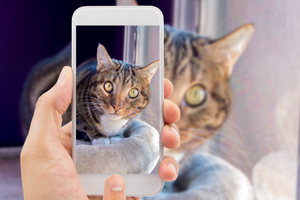 For pets who fall apart once they get to the animal hospital, askabout doing a “happy visit” a few times a month to simply pop in, say hi to the staff, and get a food reward or a chance to play. These relaxed visits add to your pet’s emotional bank account at the veterinary office so that if a withdrawal happens from a negative experience, there’sinvestment to draw from. The truth is, most animals are going to be crated or kept in an enclosed area at some point in their lives, whether for car rides, boarding, or treatment at the hospital. But you can train your pet to remain relaxed in an enclosed space. Crates are great for this type of training at home and can help safely transport pets during the veterinary visit. Top-removal crates are especially useful for cats, and in some cases, the cat can remain in the crate during the examination. 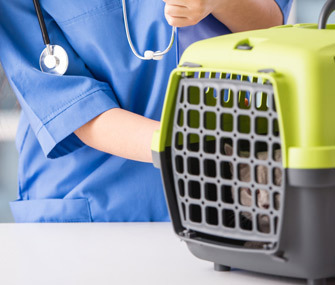 If your pet remains stressed during confinement or separation, it’s important to talk to your veterinarian and consider addressing the issue with a veterinary behaviorist or positive reinforcement trainer. Remember, stress rarely resolves without intervention.